of a sun, moon and a crowd of stars. of women hit her hard in the face. sighted and lost moment to moment. for I’m a free woman. not too late to help her out. wedded to the departed for lives on end. light and wind to smile; called her a virgin wife. and called her a whore. the eye of a storm any moment to break your neck. can flare into a raging fire to devour a whole forest. Beware! She’s a woman, a goddess, unkillable. 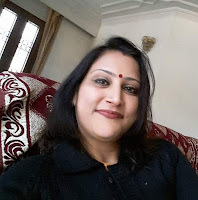 Dr. Namita Laxmi Jagaddeb is a lecturer in English at Mahima Degree College, Bijapali, Jharsuguda, Odisha (India). She writes poems in Odia and English and translates them into both languages. Her poems appear in State journals and International anthologies. Currently, she functions as the Chief Sub-Editor of ‘Rock Pebbles’, a UGC approved Peer-Reviewed Journal of Language and Literature. She is an official member of WNWU, Kazakhstan, which conferred upon her International Diploma, ‘TEMIRQAZYQ-the Best Poet-Writer of the World, 2018’ and ‘World Laureate in Literature-2018. She has been awarded the Bharat Ratna Indira Gandhi Gold Medal for 2018 by GEPRA. She has been presenting Research Papers in National & International Seminars and Conferences in India and abroad. Recently she has received the Biyotkesh Tripathy Best Paper Award (Runners Up) in International Conference on Performing the Nation, 2019, organized by Berhampur University.